There is a strong connection between chemigation, fertigation and irrigation, the goal being for each plant to receive a uniform quantity of water and additive. Uniformity of application is indeed the essential factor in successful fertigation and chemigation. Uniformity depends on several factors such as the homogeneity of water application, adjustment and use of injection equipment, compatibility between additives and application conditions, especially where wind conditions are concerned. Pivots and linear move systems are the best sprinkler application systems, given their high potential uniformity of water distribution over large areas. Small amounts can be applied, even during rainy periods or at night under windy conditions. Chemigation is the application of an approved chemical (fertilizer, herbicide, insecticide, fungicide or nematicide) with the irrigation water applied by the center pivot. Pesticides and other chemical must be labelled to state whether the product is approved for application in this way. Using proper chemigation safety equipment and procedures also helps the grower by providing consistent, precise and continuous chemical injection, thus reducing the amounts (and costs) of chemical applied. Uniformity of application. With a properly designed irrigation system, both water and chemicals can be applied uniformly, resulting in excellent distribution of the water-chemical mixture. Precise application. Chemicals can be applied where they are needed and in the correct concentrations. Economics. Chemigation is usually less expensive than other application methods, and often requires smaller amounts of chemicals. Timeliness. Chemigation can be carried out when other methods of application might be prevented by wet soil, excessive wind, lack of equipment, and other factors. Operator safety the operator is not in the field continuously during applications, so there is less human contact with chemical drift, and less exposure during frequent tank fillings and other tasks. Skill and knowledge required. Chemicals must always be applied correctly and safely. Chemigation requires skill in calibration, knowledge of the irrigation and chemigation equipment, and an understanding of the chemical and irrigation scheduling concepts. Additional equipment. Proper injection and safety devices are essential and the grower must be in compliance with these legal requirements. Nutrients can be applied any time during the growing season according to the crop’s needs. Nutrients can be applied uniformly over the field if the irrigation system distributes water unifromly. Groundwater contamination is less likely with fertigation because less fertilizer is applied at any given time and the application can correspond to the peak crop requirements. Fertilizer distribution is only as uniform as the irrigation water distribution. Use pressure gauges to ensure that the center pivot is properly pressured. Lower cost fertilizer materials such as anhydrous ammonia often cannot be used. Fertilizer placement cannot be localized, as in banding. Many fertilizer solutions are corrosive. Chemigation injection pumps and fittings constructed of cast iron, aluminum, stainless and some forms of plastic are less subject to corrosion and failure. 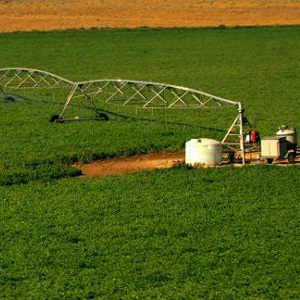 3 responses to "Center Pivots: chemigation and fertigation"
Hi! We’re starting a sugar cane farming here in Zambia. We are looking for fertigation and chemigation systems to work with our centre Pivots. The large volume of irrigation water can affect the effectiveness of diluted products that are applied, mainly insecticides, fungicides, etc. Which mechanism would most accurately control the application of these products? When applying more concentrated products the Pivot can be used alone as the vehicle by installing a secondary pipe with spray nozzles. This system requires proper sizing of the nozzles, depending on their position on the Pivot and proper automated opening and closing of the spans, depending on the advancement of the Pivot towers.